The Southern District Attorney’s Office on Sunday accused a gang of thieves of trying to plunder antiquities from a desert cave in the Judean Desert. The Israel Antiquities Authority (IAA) say the gang tried to steal the famous Dead Sea Scrolls. The suspects are six Palestinian men from the village of Seir near the West Bank city of Hebron. The Arad Rescue Unit was training in the area and noticed suspicious movement in a cave on a cliff, which set in motion the surveillance of the activity by the inspectors of the Unit for the Prevention of Antiquities of the IAA. The cave, which is 150 meters above the dry riverbed and 70 meters below the top of the cliff, is known as “The Cave of the Skulls,” and can only be reached via a narrow goat’s path that is extremely dangerous. 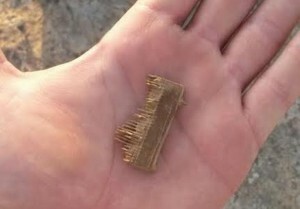 IAA Inspectors waited for the suspects at the top of the cliff, who upon arrest were found carrying ancient finds, including a 2,000 year old lice comb from the Roman period. Amir Ganor, director of the Unit for the Prevention of Antiquities Robbery at IAA said gangs of antiquities robbers have been operating along the Judean Desert cliffs for many years. “The robbers attempt to locate and find Dead Sea scrolls, pieces of ancient texts and unique artifacts that were left in the caves, particularly during the Great Revolt against the Romans in 66–70 CE and the Bar Kokhba Revolt in 132–135 CE, when Jewish fighters fearing the Roman army sought refuge in the desert,” he said. Ganor said the loot is sold for large sums of money in the antiquities markets in Israel and around the world. “It has been decades since perpetrators were caught red-handed. This is mainly due to the difficultly in detecting and catching them on the wild desert cliffs,” Ganor said.